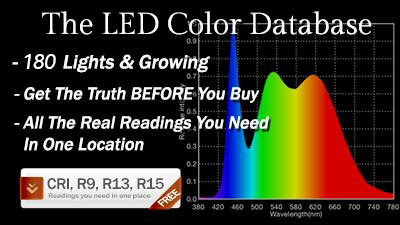 Cameras have always been sophisticated machines, whether you are working with film cameras or digital. 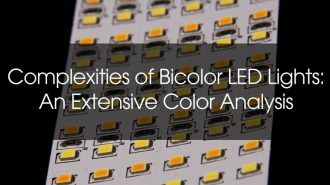 The complexity goes beyond the camera itself: accessories such as matte boxes, block batteries, follow focuses, sonar distance finders (and more) are often needed so operators and ACs can best harness the power of the camera. However as you add these accessories, you’ll need a support rig, which has many mount points to attach pretty much anything. 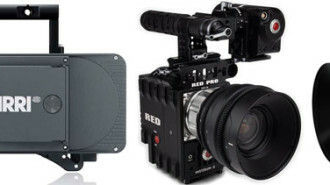 The rig also helps to stabilize modern day cameras, which tend to be much smaller and lighter than their older counterparts. 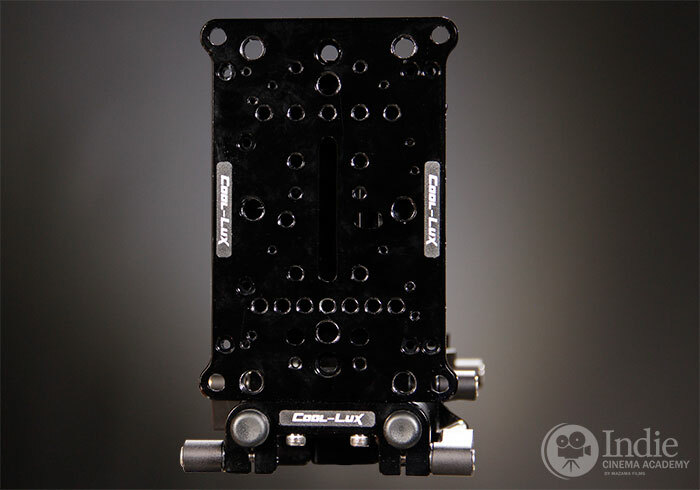 The heart of a camera support rig is the baseplate, which ties all the other pieces together. The support rig needs to be strong, securely attach the tripod quick release plate, have versatile mounting options to attach a camera or camera cage along with accessories, and allow for iris rods for accessories that mount that way. Bonus would be if it had a quick adjustment for balancing the camera, and a method to transition it quickly from a tripod mount to a shoulder mount. And since the weight of the camera and the weight of all these camera accessories quickly adds up, the camera rig itself should be relatively lightweight without compromising strength and function. Recently we tested a camera support system that incorporates many of these characteristics: the Classic Cool-Rig by Cool-Lux. 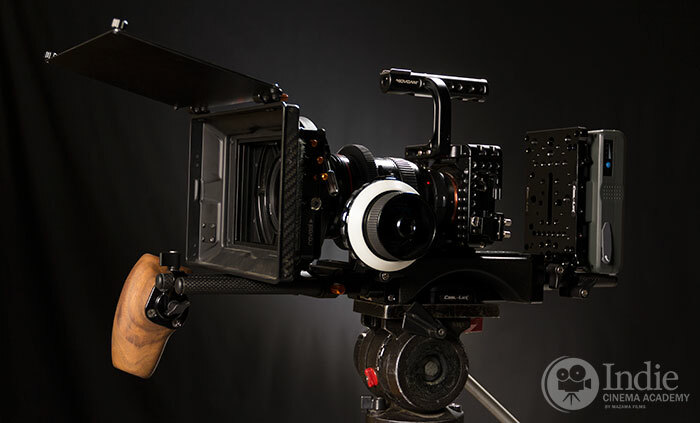 What makes this rig stand out is its innovative SHIFT Baseplate. But I’m getting ahead of myself. To test the Cool-Lux Classic Cool-Rig we mounted our Sony A7S camera, camera cage, lens mount adapter, 24mm-70mm lens, rod mounted follow focus, and matte box with rod mounted swing-away kit on the SHIFT Baseplate. This gear along with the tripod quick release plate and three prong battery were the only parts we added to the SHIFT Baseplate. When it came time to fully balance the rig, we also threw on a second rod-mounted cheese plate and a second battery (not pictured) since our standard set-up is very front heavy. However this probably won’t be necessary for those using a heavy camera or a camera that has more weight behind the camera mount point. For those needing more counterweight in the rear, Cool-Lux makes a variety of weights such as this 4.7 lb. rod-mounted counterweight that includes three 1.5 lb. weights. After using the Cool-Lux Classic Cool-Rig on a tripod and shoulder mounted, we were very impressed in how easy it is to use. It is VERY comfortable when shoulder mounted, and feels very solid. The metal and machining is high quality, and the latches and ratcheting thumbscrew are easy to tighten and have great hold. Like all rigs, it took a bit of time to make all the necessary adjustments for our specific camera system. For those who like to REALLY customize their rig, there are plenty of ways to add third-party dovetails, iris rods, risers, etc to get it “just right.” However for this test we only used the rig accessories that were included. Since this rig was so well thought-out, that was all we needed to make this work. On top of the SHIFT Baseplate is a sliding dovetail plate that allows for balance adjustment forward and back (in these pictures, the front is on the left). Along the midline of the dovetail plate is a groove, allowing rough balancing as you mount the camera. More precise balancing is done by sliding the dovetail plate, which is quick and easy; just flip the dark gray latch (shown in the upper left of the picture), adjust the dovetail, then tighten the latch. The groove takes both 1/4″-20 and 3/8″-16 camera mounting screws (one of each is included with the baseplate), and the underside of the groove is inset so as to not interfere with sliding the dovetail plate. There is also a safety pin (silver hex screw in the middle of the array of 1/4″-20 taps, seen in the above picture). This prevents the dovetail plate from sliding off the baseplate. A very important feature! Unfortunately the groove doesn’t run the full length of the dovetail plate so camera attachment is limited. However keeping the groove short makes sense since a long groove would require removing too much metal, significantly weakening the plate. A shorter groove did make it a little trickier for us to mount our camera cage. We ended up flipping the dovetail plate around (“reverse configuration,” see next picture) by first removing the safety screw, sliding the plate off, reversing it, and reinserting the safety pin. When we configured the rig for our camera system, we reversed the dovetail plate, mounted the camera (in its camera cage) in the middle of the dovetail plate, and kept the dovetail plate all the way forward. 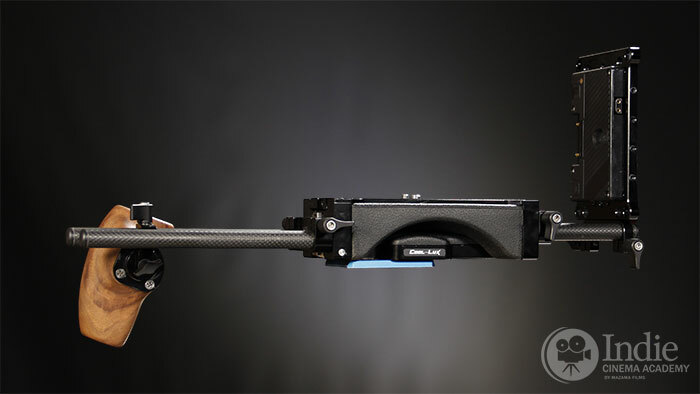 This is basically the photo captioned: “Dovetail plate slid all the way forward (reverse configuration).” The reason for this is that we needed the camera as far back on the baseplate as possible for balance, while still having iris rods underneath our lens so the follow focus would reach. If the iris rods were full length, we would have mounted our camera much farther back. Two things to note in the reverse configuration: 1) the safety pin no longer protect the camera if the dovetail slides backwards, and 2) the dovetail clamp doesn’t tighten when sliding the dovetail more the a few inches. The safety pin no longer protects because the back part of the baseplate that holds the dovetail plate is wider than the plate so the dovetail plate is complete free of the baseplate before the safety pin hits the stop. The dovetail clamp can’t tighten because it is placed in the front half of the baseplate. Once the dovetail plate slides back behind the clamp, it is tightening only against air. Underneath the SHIFT Baseplate are mount points for tripod quick release plate. Note silver chest support release latch in lower right corner. Beneath the baseplate are four 1/4”-20 taps and four 3/8”-16 taps, giving you plenty of options to mount a tripod quick release plate. Since it is always best to have two attachment points between the rig and the tripod quick release plate — to keep the plate from spinning — having so many taps is a huge plus. The metal around the taps is solid ensuring that the mount points will hold up over time and stay securely attached to your tripod. Also the bottom of the baseplate is flat with plenty of surface area creating a broad interface. There aren’t any lateral attachment points in case your camera set-up is side-heavy from a monitor. This isn’t a big deal at all; you really should reconfigure your set-up if you are extremely side-heavy so that the center of gravity is along the midline. 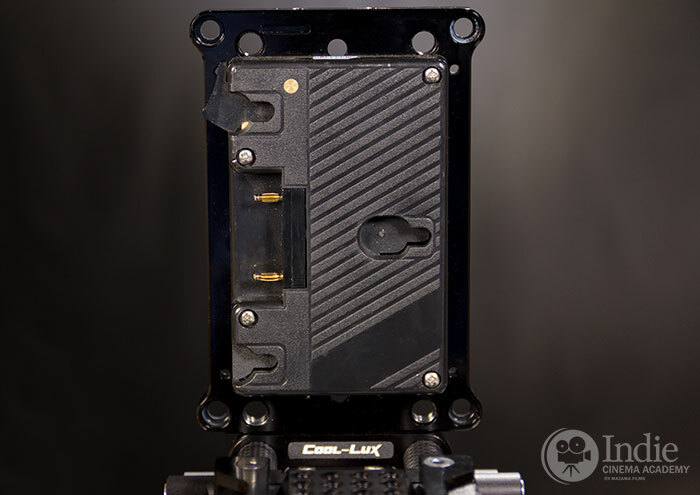 The Cool-Lux SHIFT Baseplate incorporates an innovative patent pending “Quick-Shift” shoulder mount into the baseplate. Very cool! Flip the silver latch and the spring-loaded chest support immediately drops down. The rig is now 100% ready to be shoulder operated. No fussing, no balance adjustments, no adding padding: the pad is built into the chest support and baseplate. The shoulder pad is very comfortable, allowing camera operation all day without discomfort. Plus the molded pad appears to be very durable, so it should hold up after years of use and abuse. 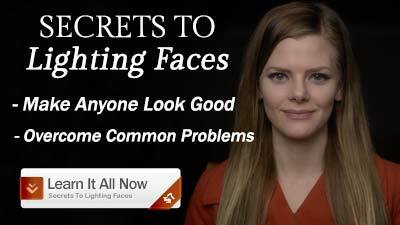 It is made of a firm, dense foam that can withstand the weight of most camera systems. 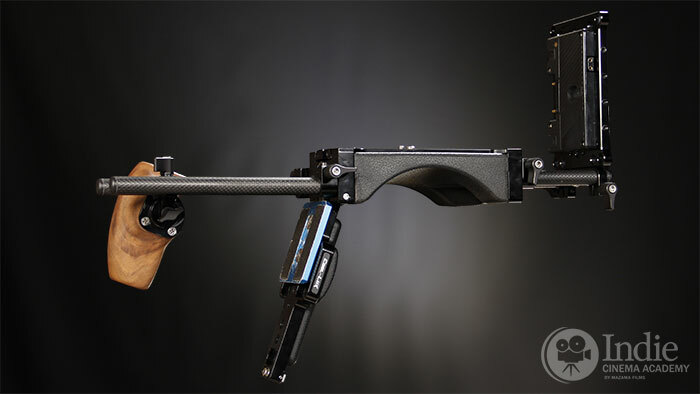 This design is so much better than other rigs that require a separate pad to be attached before shoulder mounting, a pad that you have to carry around with you (at best) and can get easily get lost (at worst). 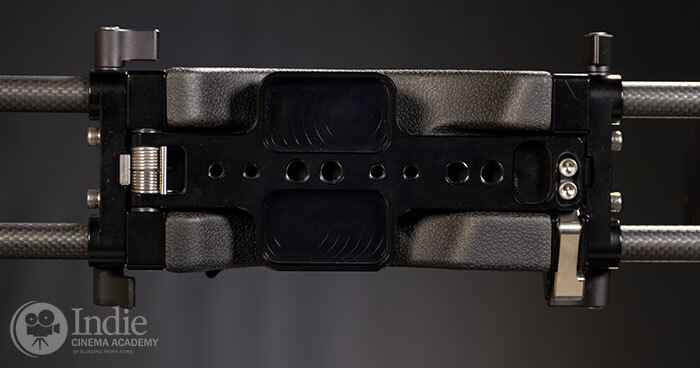 The molded shoulder pad is built to exactly fit on your right shoulder, which is where all camera operators work from. The asymmetrical design helps it to keep from sliding away from you. Additionally, the finish on the shoulder pad makes it easy to wipe down with a wet towel if got dirty or sweaty. Looking up at shoulder pad with chest support seen at left. Notice how pad is asymmetrical to better fit on your right shoulder. We were curious if the shoulder mount release could be accidentally triggered while mounted on our tripod. First off, there is a metal ridge that makes it hard to accidentally trigger the mechanism. Second, since the the hinge for the chest support is in the front, the weight of the rig actually resists falling forward when the latch is flipped. We tried various scenarios to see if an accidental release would be a concern, and the rig did very well. Even after front-weighting the rig with a longer lens AND removing all weight in the back (i.e. the cheese plate and battery), the rig still didn’t want to fall forward. The only situation when it might be a concern is if the camera is already significantly tilted forward and then the latch was triggered. However, since our camera system is front heavy to start with, the tripod quick release plate had to be mounted right up against the chest support hinge. The result is that the quick release receiver will not let the chest support open up while it is still mounted to the tripod. No way, even when tilted forward. Front risers can be significantly raised and lowered. (Rear riser adjusts the same.) Directly behind riser is the forward/rear adjustment for the chest support. Many modern baseplates incorporate rod risers so that the rod height can be adjusted depending on what camera and accessories you are using. Traditionally rods for video work are 15mm in diameter, 60mm apart (center to center), and 85mm from the center of the rod to the optical center of the lens (which is the axis that runs through the center of the barrel of a lens). By having risers, the rig can be adjusted for smaller, shorter cameras so that the 85mm standard can be maintained. Without risers, some follow focuses and matte boxes that are based on the standard couldn’t interface properly with the camera lens. The SHIFT Baseplate riser has a good range to it, although if the front risers are dropped too far they start to interfere with opening the chest support plate. Even though our Sony A7S doesn’t have much base to it, even with a camera cage, we had no problem reaching the 85mm standard height. The ratcheting thumbscrews on the rod clamps are a lifesaver, since many times you need to reposition the angle of the tightened thumbscrew so it doesn’t interfere with rod mounted accessories. If you’ve never used ratcheting thumbscrews, you’ll never go back after you have. Just pull the thumbscrew out and it disengages the tightening bolt, allowing you to reposition the thumbscrew. One downside to not having continuous rods front to back is that if the dovetail is pushed back too far, there are no rods directly under the back half of the lens. 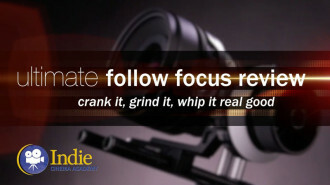 If your system requires your follow focus to be close to the camera body, you’ll need to do some custom rigging. Some options are to mount continuous rods on top of the dovetail plate (which might make the support rig top heavy), or else add weight to the back of the support rig so you can slide the camera body forward. This seems to be the necessary compromise to be able to have a lightweight baseplate with an integrated shoulder pad. A rod-mounted cheese plate, while not totally necessary, is very useful not only for balance, but also as an extra place to mount accessories. It is the perfect way to make the weight of a heavy battery useful in balancing the entire camera rig. The Cool-Lux universal cheese plate has A LOT of mounting options! First off there are mounting holes for three types of batteries and hardware: V-Mount Style battery plates (IDX, Switronix, etc. ), three stud battery plates (all versions including: Anton Bauer QR and QRC types, etc), and the Switronix Jetpack. Additionally there are mount points for the AJA Ki Pro / Ki Pro Mini, and the Teredeck Bolt. If this still doesn’t meet your needs, there are generic 1/4″-20 and 3/8″-16 taps too. And if you want the cheese plate oriented horizontally, there are also #10-32 taps to reposition the rod clamp. Like the rest of the rig, the metal and taps on the universal cheese plate are high quality and very strong. The ratcheting thumbscrews make tightening the rod clamps easy, even if you have limited room. 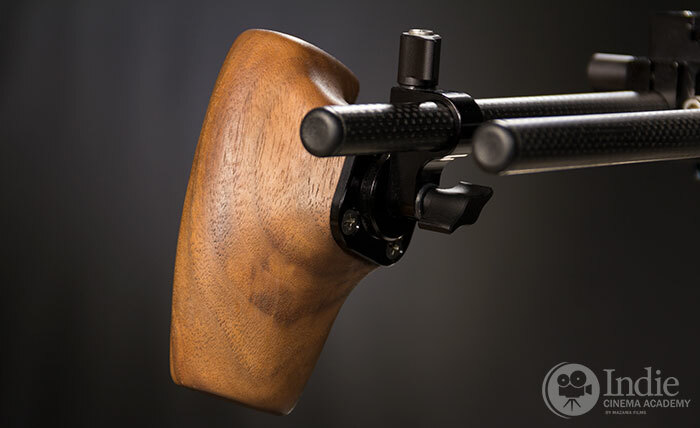 Walnut grip mounted on the right iris rod. Note the adjustable rosette to tilt the grip forward and back. 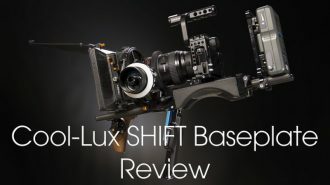 Another option for the Cool-Lux SHIFT Baseplate are grips. These are almost a necessity when using shoulder mounted rigs because it gives the operator a solid place on the front of the rig to grab the camera rig. Traditionally operators would just grab onto the sides of the matte box, but with today’s lightweight matte boxes, that isn’t always a good idea since they are more fragile and sometimes a bit flimsy. 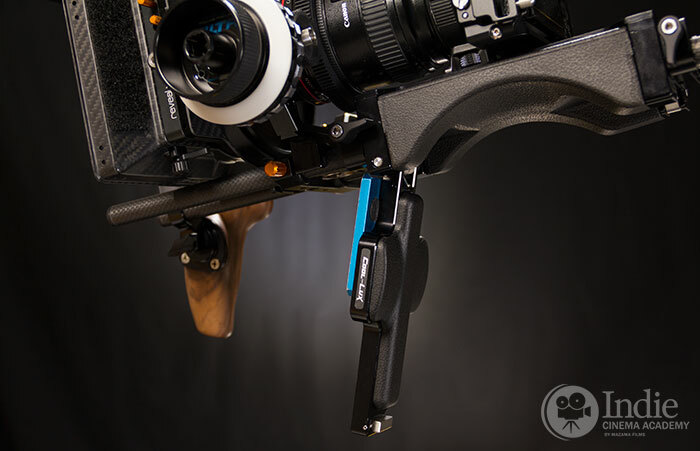 We tried out the optional walnut grip on the SHIFT Baseplate, which was very comfortable. 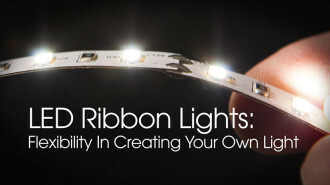 It is carved to perfectly fit into the operator’s hand, something that is very difficult with rubber and metal grips. Plus, the texture and feel of the walnut is extra nice, especially after filming long days. There is a rosette on the side of the rod mount to allow the walnut grip to be repositioned and different angles, depending on what is most comfortable for the operator. Some may ask why only one grip. 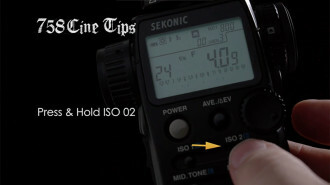 Well, for solo-operators and those whose AC can’t pull focus for that shot, the operator needs their left hand to work the follow focus or focus the lens directly. So only their right hand needs a grip. The only downside to this grip is that it is single rod mounted. This means that there is the potential for the grip to spin. 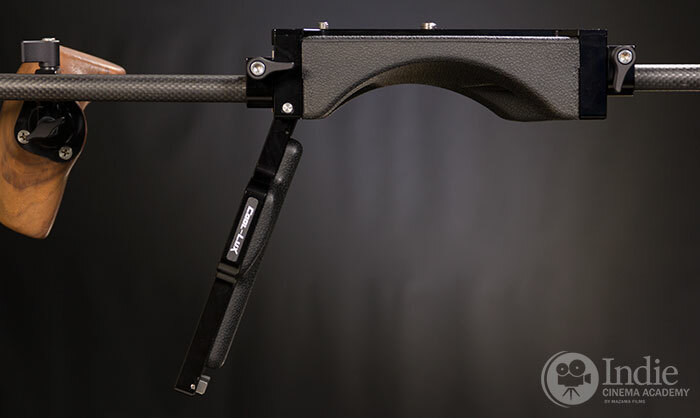 We mounted the walnut grip to both the carbon fiber rods that comes with the Cool-Lux Classic Cool-Rig as well as the stainless steel rods we normally use. After repeatedly tightening the rod clamp on the grip, we found it still spun a little. This is no surprise since we have never seen a single rod mounted grip — or follow focus for that matter — that didn’t spin. The round, smooth surface of the clamp against the round, smooth surface of the rod is too difficult to keep from slipping. That being said, we found that the walnut grip moving a little didn’t affect its operation. For those operators who prefer dual grips, check out Cool-Lux’s Dual Grips. They telescope so you can position the grips at whatever height is most comfortable. 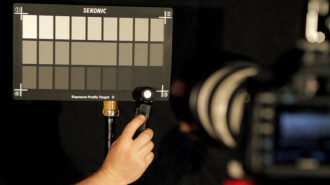 Dual grips are used more when the operator has an AC who is pulling focus with a whip or crank, or is using a remote follow focus. 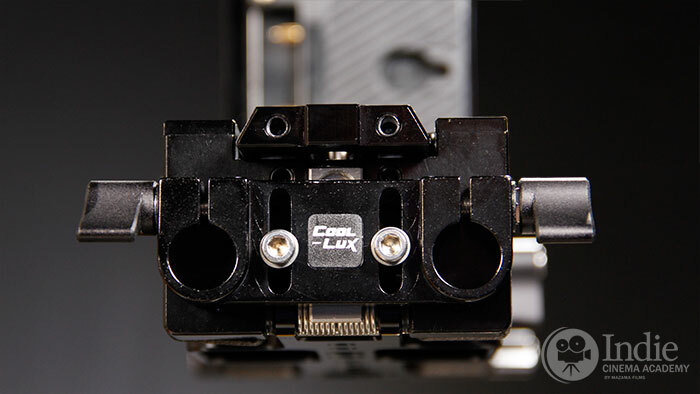 The Cool-Lux Classic Cool-Rig is a well built, carefully thought-out, and have a lot of innovation in it, especially the SHIFT Baseplate. Shoulder operating with this rig is so much more comfortable that many other rigs we have used. And the fact that you can switch between tripod and shoulder so quickly, with no extra parts needed is a HUGE bonus. 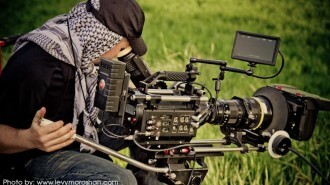 And while this rig might not work with EVERY camera in existence, what rig can? Just like a sports car can’t do off-road very well, and SUVs aren’t great on the race track, camera support rigs should be selected based on the needs of the project and the operator. That being said, I highly recommend checking out this rig and seeing if it works with your camera system. Because if it does, you really should get it. Disclaimer: We are not associated with Cool-Lux or its staff. 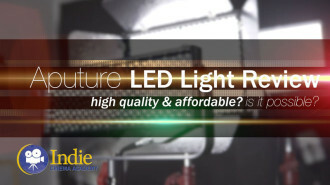 Cool-Lux did not pay us for this review, which was conducted on a demo rig loaned to us. 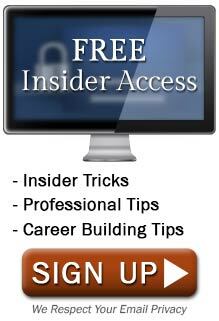 We do receive a nominal fee on purchases made through product links. 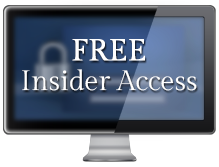 We use these proceeds to fund the time and effort to conduct these reviews and future reviews of other products, and do not let it bias our review at all.